Dock Hardware | Dock Straight Bracket, 6" L., 1-1/2" Pipe| VE-VE Inc.
Home :: POST Dock Brackets ( #5 ) :: ( #2 ) "POST DOCK BRACKETS" For 1-1/2" dock pipe ( 1-7/8" O.D. ). :: D-555; "Straight Bracket" ( For 1-1/2" pipe. ( 1-7/8" O.D. )). The D-555; "Straight Bracket" features a angle iron dock mount with square mounting holes for mounting with 5/16" Carriage Bolts - NOT INCLUDED. It is made of 3/16" Th. 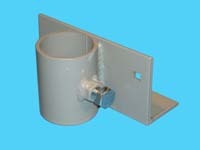 x 2" x 3" Angle x 6" long with an adjustable sleeve made of 2" pipe welded to it. The sleeve has a 1/2" nut welded to it for the adjustment bolt ( 1/2" bolt included ). It's used to fasten 1-1/2" dock pipe to side of dock section. Usually used 2 ea. per dock section. Industrial gray painted finish. Sold singly. NOTE: Install with 5/16” carriage bolts NOT INCLUDED. Use 1 ea. D-460; "Fastener Kits" Per 2 ea. D-555 brackets. ( CLICK HERE ) To go to D-460 "Fastener Kit". D-55; Vinyl Pipe Cap. ( For 1-1/2" pipe. ( 1-7/8" O.D. )).